In spite of the huge marketing blitz about the March 6 release, not everyone seems to have received the message. Telling 9.8 million Facebook fans and 366,000 Twitter followers that you’re going to release a highly anticipated product a day early is good marketing — that is, unless you fail to tell the stores that are supposed to sell this item. On Monday night, Taco Bell announced via its social media channels that it was going to be selling the new Cool Ranch Doritos Loco Taco a day earlier than planned, telling hungry customers they just need to ask for one starting today. But we’ve already received numerous complaints from Cool Ranch-craving consumers who went to Taco Bell ready to try the new experiment in breath-ruining fast food, only to be turned away. Like the other people who have been denied the Dorito-shelled dish, Lisa says each store claims it won’t be available until tomorrow. And she’s not alone. The Taco Bell Facebook page is filling up with comments from angry/hungry (hangry?) customers. Other customers say they are being told that they need to show a coupon in order to get the taco a day early. People have begun posting the addresses and store numbers of the Taco Bells that deny them their Cool Ranch lunch. We’ve reached out to Taco Bell HQ about this and will update if anyone responds. So far, we’ve seen no reply to the angry customers on Facebook, though the @tacobell Twitter feed is responding to some customers who have enjoyed the new taco. While the official launch day of Cool Ranch Doritos Locos Tacos is tomorrow, we’re humbled by the overwhelming response to Fan Day. We apologize to those fans who couldn’t buy it a day early and are working hard to have all participating locations honor Fan Day today. 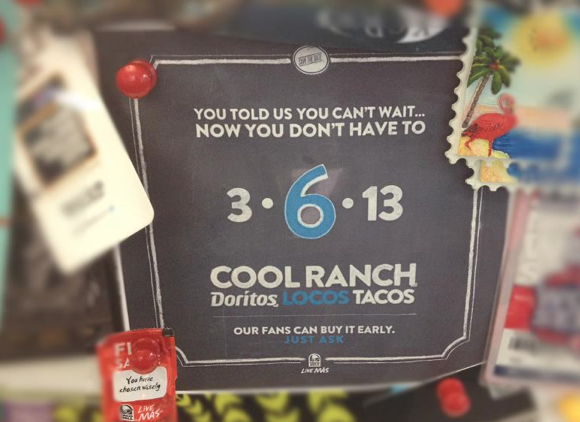 We want to assure everyone that Cool Ranch Doritos Locos Tacos will be available nationwide tomorrow, March 7.